Happy New Year! Here’s to wishing you the best year yet in your business! Let’s make it a great one. As I was reflecting back on 2016 and even further back into the past few years in my business, one thing was very clear. I would not be where I am today were it not for the people I’ve worked with – whether it’s my team of employees, business coaches, mastermind gals, mentors, other small business owners and of course my clients. If I can stress one thing as we start fresh in 2017, it’s this: Now, if you’re thinking…I’m just getting started and barely able to pay myself….how do you expect me to start hiring people and create a team? Well, I want you to look at that word “team” in a non-traditional sense. Step out of the box of thinking that the only way to grow a team is to hire employees. a number of persons associated together in work or activity as a group on one side. That’s it, that’s all we need. People working together as a group on one side, aka: people working together for the same goal. This past year I grew my current team quite a bit as far as my employees go and let me tell you, they are awesome. But, prior to that and even currently I still have a slew of people that I consider to be on my team – some of them are paid, some are not. Heck, some of these people may not even know how much I value their content. These are people that believe in me, support me, provide value based products and services (some even free!) and overall make me and my business better. I’ve got a business coach that keeps me on track and helps me filter through all my crazy ideas and to-do’s, an attorney that helps keep me legit and assists with any legal matters, I’ve got mastermind groups that provide invaluable ideas and advice, content strategists that tell me what I should be writing about, SEO experts that analyze traffic and everything going on behind the scenes, I’m in multiple facebook groups where other small business owners provide free content all the time that have helped me and by business beyond imagination, and I’ve even got people that I subscribe to their lists so I can get their weekly content that’s usually loaded with good stuff – all because they want to help other small businesses just like themselves. All of these people are on my team, whether they know it or not. So, you see? Your team can be made up of people that are on the same page as you, ready to support you in multiple ways. They don’t have to be your employees – maybe they provide free content that’s just what you need, maybe they provide a one time service for you or maybe you are a part of their membership group. Whatever it is, I urge you to consider where you’d like to start growing your team. Think of your pain points in 2016 – what do you want to change in 2017? Start there. Who can help you achieve your goals? Who is an expert in the field you’re struggling in? I’m so excited to be a part of an amazing team that exists to support you and educate you in all things business finances. Brittany Griggs is the financial business coach for creatives. She helps you create a budget, profitable pricing for your services and offerings and a cash flow plan so you stop running out of money. Overall, she helps you eliminate the guessing game! Amy Northard is the CPA for creatives. She’s an expert in taxes – everything from helping you understand your sales and income tax rates to how to file a 1099 for your contractors to filing end of year taxes for you and your business. It sounds complicated but she makes it easy, trust me! We call ourselves The Financial Dream Team and our #1 goal is to make finances easy for you! If budgeting, cash flow, bookkeeping or taxes just to name a few are your pain points – let us join your team! We’re offering a FREE 4 day email challenge that starts Monday, January 9th and will provide you with 4 easy, actionable steps to get your finances on the right track for 2017. At the end of the challenge we’re offering a bonus free workshop where we’ll dive even deeper into the steps provided in the challenge + you’ll be able to ask live questions during the workshop! We’re so excited for this and we hope you’ll welcome us to your team. We want to not only see you succeed but also feel complete confidence and peace about your finances. We are here for YOU! 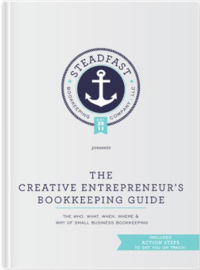 « 2016 Steadfast Bookkeeping Highlights!